I don’t know why the tone of voice made me cry. Perhaps because it felt like the sudden, unexpected jolt of pain one gets when one brushes up against a cactus. Many a time whilst wandering out in the desert I’ve inadvertently touched a cactus—and the results always prove painful. Sometimes, the sharp spines produce instantaneous pain and draw blood (like the time a cactus cluster impaled me while riding my mountain bike down a trail). Other times, one thinks one has escaped unscathed from a cactus encounter only to find that tiny, invisible, hair-like spines have imbedded themselves in one’s skin. Those take a strong light and a pair of tweezers to remove. When I first lived in the desert, after spending most of my growing up years in the lush Pacific Northwest, encounters with cacti always surprised me. 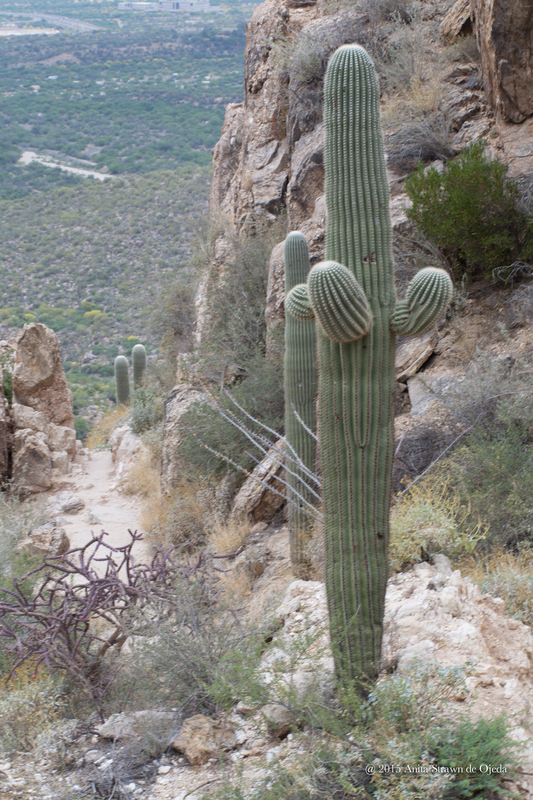 The locals pointed out one particular flavor of cacti and claimed that the Jumping Cholla could jump out and attach itself to unwary hikers. At first, I had no patience with the desert and its wasteland of browns and dearth of beauty. For four years we lived on the edge of the desert and wandered in to camp and hike and bike and explore. 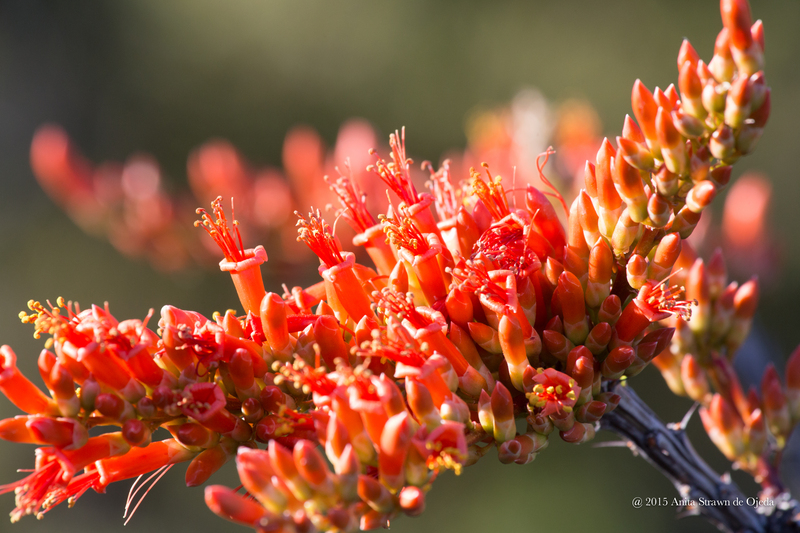 Each foray into the desert revealed beauty—ocotillo in the spring with gaudy red flowers waving frantically from narrow, spiny limbs; unexpected snowstorms in the winter laying a soft, transient carpet of white over browns and beiges; kangaroo rats hopping close to our campfire to investigate the trespassers. The fifth spring we lived in the desert produced a miracle of flowers such as we had never seen before. The winter rain and sunshine had created the perfect combination to bring forth verbena in a flashy, stunning carpet of violets, pinks and whites. All that hidden potential burst forth and flourished in a cacophony of color. The next winter, each rainstorm buoyed my hopes that I’d have another chance to wander through carpets of flowers out in the desert. I eagerly packed up for our first drive of the spring—fully expecting to find the same beauty I had seen the year before. Alas, only a few verbena greeted me as we drove down one of our favorite four-wheeling roads. And then we got stuck. I grabbed my camera and got out of the truck while the men did their manly thing. Instead of verbena, I discovered that almost every cactus plant had sprouted flowers! The frequent stops for getting the vehicles unstuck gave me the perfect opportunity to photograph hundreds of different blooms. Once again, the desert surprised me with its ever-changing beauty. We all have people like that in our life. People with whom our relationships seem dry and barren and without hope (not to mention full of prickly feelings). 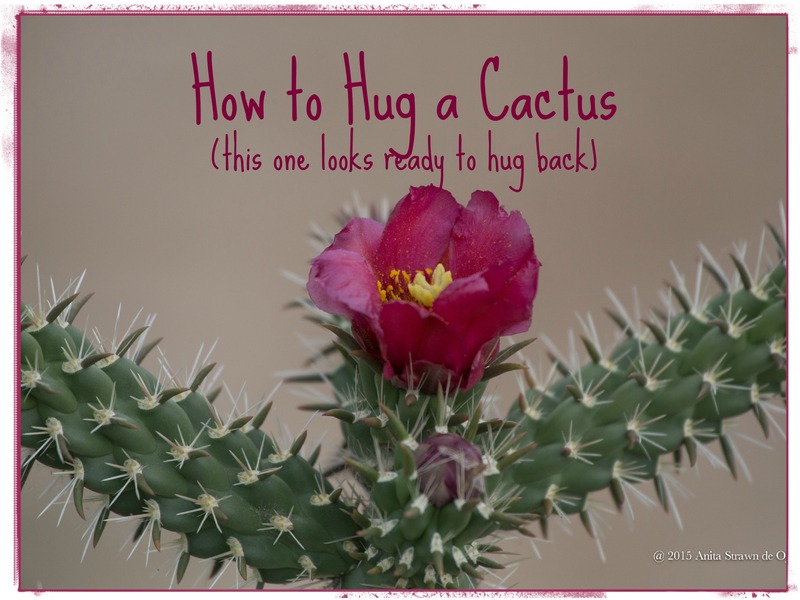 So, while I might not be able to REALLY give advice on how to hug a cactus, I can share the parallels between what I’ve learned about the desert and what I’ve learned about prickly people. 1. Keep coming back for more. Just like I didn’t write off the desert after my first encounter, so I am learning to not get discouraged when dealing with prickly people. Each interaction brings to light new information that helps me feel compassion. 2. Keep a record of the beauty you discover. 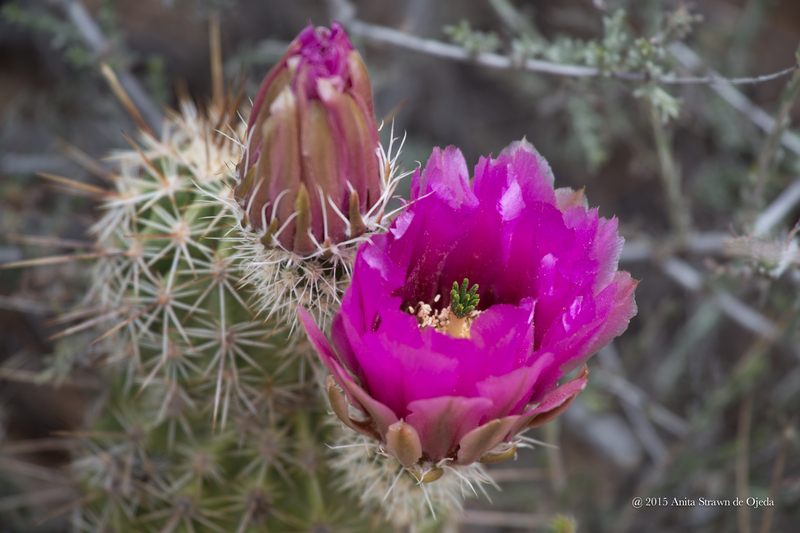 I used my camera to document the changes and the close-up beauty of the desert. My college friend’s daughter recently passed away in a tragic accident. My friend has been reading through her daughter’s prayer journal and discovered that when Maddy had a problem with a person, she would list all the positive things she could think of about her ‘prickly person.’ Then, she would pray for that person. What a beautiful way for a young person to handle the stresses and disappointments of relationships and interactions. My heart felt humbled when I read about Maddy’s method of dealing with prickly persons, and I plan on incorporating her method into my life. 3. Beauty will bloom. You might not be present for the once-in-a-decade display of desert flowers, and you might miss the results of your kind behavior towards a prickly person. But someone else will see it and benefit from the trickle-down beauty of you treating a prickly person with love, respect and kindness. 4. It’s not about you. Prickly people often don’t understand their own prickliness. Have patience and self-control. After all, the prickles and spines belong to the cactus. 5. Let the expert remove the prickles. Sometimes, it takes a strong Light to remove the spines that fester and irritate us. Only through my own relationship with God will I find healing from the unkind words or actions that irritate and fester. It’s not easy to let those wounds go sometimes, because it feels good to have a justification for our angry actions or unkindness towards a prickly person. 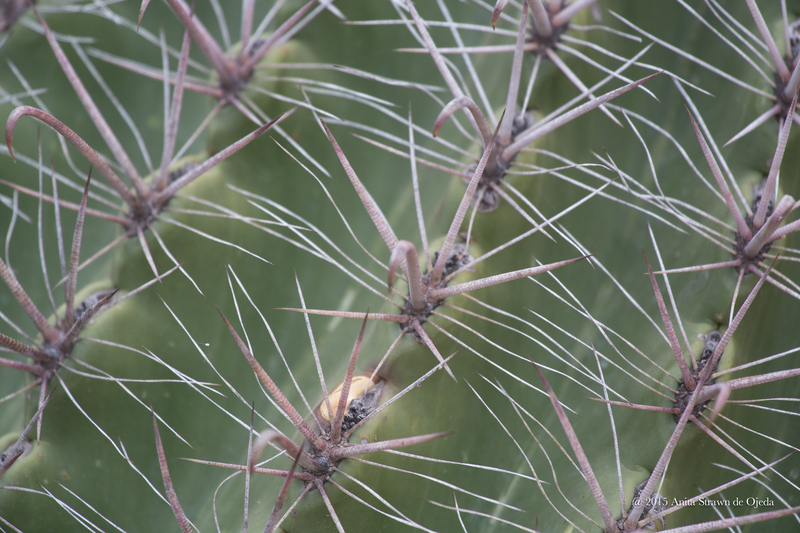 Let’s face it—we all have prickly people in our lives. Click To Tweet People who grouch and complain and seem friendly one minute and aggressive and angry the next. But we don’t have to let the cacti ruin our view. How have you dealt with prickly people in your life?